A phlebotomist is a person who draws blood in a hospital, clinic or research lab setting. They may also work in blood donation centers. 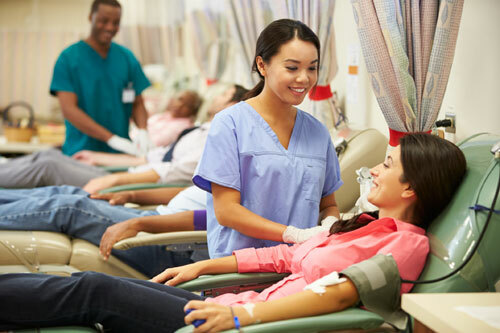 If you’ve ever given blood at a blood drive, or if your doctor ordered a blood test during a check-up, the person who poked a needle into your arm and extracted blood into a tube is most often a certified or licensed phlebotomist. Phlebotomists tend to work in fast-paced settings where there is occasionally some pressure to meet the needs of large numbers of patients. However, phlebotomy training emphasizes careful attention to detail, and taking time and care to complete each procedure properly. Work environments most often are modern and clean clinic, hospital and lab settings. Incidentally, the profession is dominated by women today, averaging about 85% female phlebotomist to 15% male co-workers. is the average yearly salary for phlebotomists. have a Post-Secondary certificate while 33% have a High school diploma. Some states require licensure and others certification, but the difference is a matter of local regulation. Before phlebotomists get licensed or certified they must first be a high school graduate and then enter a phlebotomy training program. These are usually require 4 months (one semester) to 8 months (two semesters). Again, this will vary depending on location. Each state has different requirement for licensure or certification. In addition to drawing blood samples, phlebotomists may also assist in transfusion procedures. Another common part of the job description is to “explain blood draw procedure to patients” and help with patient recovery if an adverse reaction happens during or after a procedure. The median pay for a phlebotomist is $31,630 according to the BLS.gov May 2015 reports. The lowest 10% earn $22.850 and workers in the highest 10% range can earn $41.190. This makes for an average hourly wage of about $15.20 per hour. Several variables control pay levels, from experience and location, to the kind of facility in which a phlebotomist is employed. The job outlook for phlebotomist is excellent. The U.S. Bureau of Labor Statistics predicts there will be a “much faster than demand” rate of job growth at 25% through the year 2024. In 2014 there were 112,700 phlebotomist jobs in the United States.